Not all cases are quite the same. More often than not, some cases are complex and require a little more time. Yet, the results are life-changing. Check out our most recent success story. Keenan is an active, bright, positive young boy, but at the age of 4 years 5 month he was unable to climb play structures, go down slides, swing, go on a teeter-totter, walk up and down our staircase at home, go upside down, play in a pool and engage in many other activities four-year-olds love doing. Going to parks was stressful for Keenan. Then, when Keenan became aware that he could not do what his buddies were doing, he became withdrawn in social settings and had a lack of belief in himself. We enrolled Keenan in Occupational Therapy, hoping this would help Keenan. Keenan made some progress, but then our OT referred us to Wow Vision Therapy. 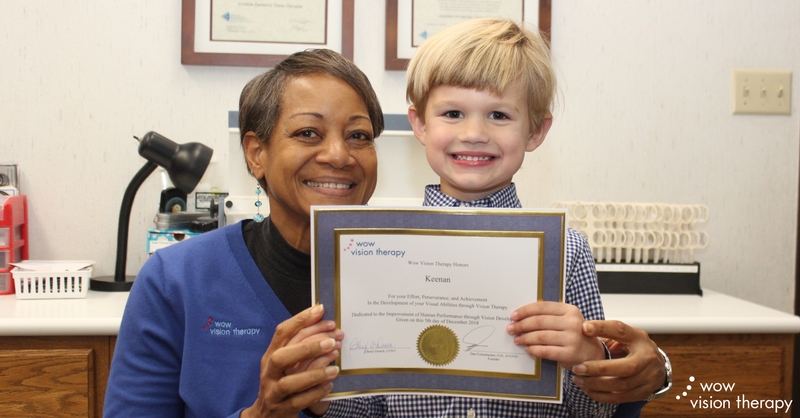 Keenan was diagnosed with Oculomotor Dysfunction and Fusion with Def Stereo. Dr. Dan found that Keenan’s eyes did not converge together as they were supposed to and Keenan had extremely limited depth perception. We were blown away by these findings and this diagnosis. Keenan was not seeing the world around him in 3D as we all see it, this explained Keenan’s fear of all motion. After 30 sessions with the patient, kind, energetic, innovative and caring Miss Cheryl – Keenan is a changed little boy. Keenan climbs the tallest play structure, swings on anything, does backward & forward somersaults – you name it he does it! And most of all, Keenan has a brand new exuberant confidence to him! His personality has blossomed more too! We will be forever grateful to Wow Vision Therapy and Miss Cheryl! Miss Cheryl will hold a special place in our heart forever. Concerned you or your child may be struggling with a vision dysfunction? Schedule an appointment today with one of our teams.